Say “welcome back” to healthier, thicker, younger-looking hair. Hair gets thinner with age, which can result in a reduced active growth cycle and hair loss. The subcutaneous layer of the scalp also thins, causing strands to become more brittle and prone to breakage. 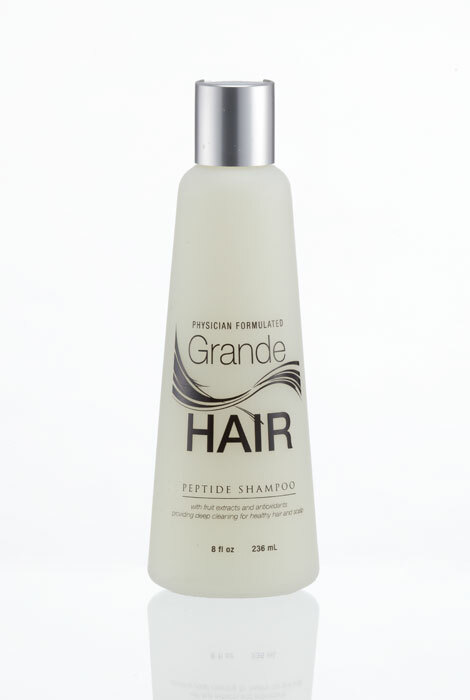 To combat the effects of aging and give you a head full of lush, gorgeous locks, GrandeHAIR Shampoo works at the cellular level to foster healthy follicle activity. The exclusive clear liquid Nutra Peptide hair growth shampoo formula contains hextapeptide-11, which is clinically shown to help increase collagen production and improve hair growth. Fruit extracts and antioxidants are combined to harness the power of nature to rejuvenate and rehabilitate your hair and scalp. Natural exfoliating properties work to clear hair follicles of dead skin and make room for thicker hair and a healthier scalp. Use daily and massage will, then rinse throughly. Has made my hair healthier and gives my hair body. I wanted to try it because I've got aging hair.Iuse to use another brand that you had but can't can't get it anymore so I decided to try this brand. I chose this shampoo because it is a clear preparation. BEST ANSWER: Thank you for your question. 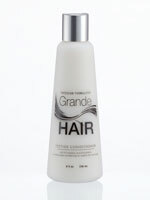 The GrandeShampoo is safe to used on dyed/colored treated hair. It can also be used for both men and women. We hope this information will be of help to you.